Happy Guest House is a popular accommodation owned by a Cambodian family whom provide all guests with excellent hospitality, honesty, and sincere friendliness. The owner of Happy Guest House speaks excellent English, French and Vietnamese. Happy Guest House is designed for the traveler who wants the comfort of a nice and clean guest house at a reasonable price. 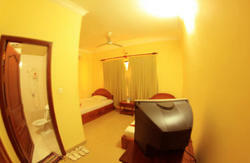 Happy Guest House has the atmosphere of homely stay while you are away from home. Our guest house is centrally located just off the main road on a quiet and safe street. (15min walk to the old market/Pub Street) The surrounding area has many guest houses, ATMs, Supermarkets, restaurants, BBQ areas, Gym, massages, and salons. Close to all the cities attractions, Happy Guest House is in an ideal location to experience all of Siem Reaps excitement. After a long day exploring Siem Reap, return to a peaceful room for some well deserved rest on our comfortable foam mattresses. If you are hot from a long day of exploring Siem Reap, relax and enjoy a swimming pool that is less than 1 min walk from our guest house for only $3 for the entire day! 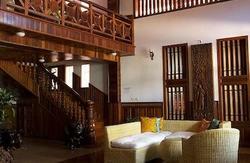 Our guesthouse has many common areas to meet other travelers. From a large front patio where you can check out our breakfast, lunch and dinner menu, to a beautiful wooden balcony which allow guests to relax and read a good book. We can arrange all types of Angkor tours and Siem Reap tours with cheap and hassle-free tuk tuk drivers and tour guides. Our goal is to help you get the most out of your time in Siem Reap. The friendly and knowledgeable staff can provide tourist information on Angkor tours, adventure activities, local sights, spa recommendations and local market shopping advice within Siem Reap. 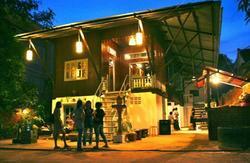 Bus, boat, and flights to all of South-East Asia can easily be arranged at our guesthouse. We have many local and regional guide books and will happily lend you one of our well thumbed Angkor Guide books during your stay with us! For guests who kindly give the job to our drivers who pick you up from any stations, our driver will free of charge for the all pick up service from any place. Please do let us know your arrival time information if you may need pick up service from our property!! Other guest houses pay Tuk Tuk drivers a commission to take you to their hotel, usually because they are far away out of town. Tuk Tuk drivers often give out false information to try and convince travellers to stay somewhere else, for example they may say that this hostel is full. They may also try and claim that there is a second happy guesthouse - there is only ONE happy guesthouse. We offer a Free pick up service, please contact us with your arrival details by bus, boat or airplane and we will have free transport ready and waiting for you at any time of the day or night. Once you have booked just look out for the sign with your name on it! You MUST e-mail to us if you are traveling by BUS from Laos or BANGKOK (Poi Pet entry) so that we can send you a VERY USEFUL e-mail to help you avoid any scams. When you are HAPPY, we are HAPPY! We hope you will enjoy staying here and learning about the Cambodian Life.